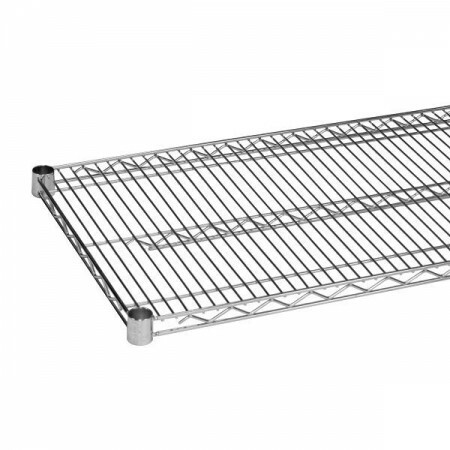 $29.99 Royal ROY S 1460 Z Polycoated Zinc Wire Shelf 14" x 60"
$48.99 Advance Tabco EG-1460 Green Epoxy Coated Wire Shelf 14" x 60"
$25.92 Winco VC-1460 Chrome Plated Wire Shelf 14" x 60"
$25.61 Winco VEX-1460 Epoxy Coated Wire Shelf 14" x 60"
The Thunder Group CMSV1460 Chrome Wire Shelving 14" x 60" is ideal for storing all sorts of food items at your restaurant or other food service establishment. Thanks to its heavy duty chrome-plated metal construction, this corrosion resistant wire shelf is durable enough to withstand heavy volume use and is designed with a stylish appearance that will look great in any kitchen. To allow for easy setup, this NSF approved piece includes 4-set plastic clips.